New light rail and other rapid transit solutions could be integral to our future transport networks across England’s town and cities, Light Rail Minister Jesse Norman will announce today (7 February 2019). 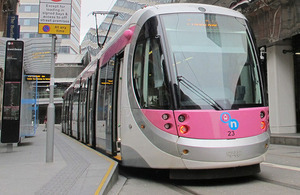 The announcement came as the minister visited the extension of the Midland Metro light rail system in Birmingham — one of the 8 light rail systems in England responsible for 267 million journeys every year — to see how similar networks could rolled out across the country. "The Midlands Metro network shows how government support can help to create a sustainable, accessible and innovative light rail system, which forms an integral part of a modern urban transport network. "This is a great time to explore the incredible potential for light rail schemes across the country. Today’s wide-ranging call for evidence seeks new ideas and new support for the next generation of light rail, so that we make existing systems work better, and can work with cities and towns across the UK to create new ones." The Midlands Metro extension — adding an additional 5 tram stops between New Street Station to Five Ways roundabout in Edgbaston — has benefitted from a £60 million government grant. The same round of funding also gave £83 million to Transport for Greater Manchester to support the procurement of 27 additional Metrolink trams in Manchester. Transport Secretary Chris Grayling recently visited Manchester to discuss how an innovative tram-train could deliver more reliable journeys and cut congestion.